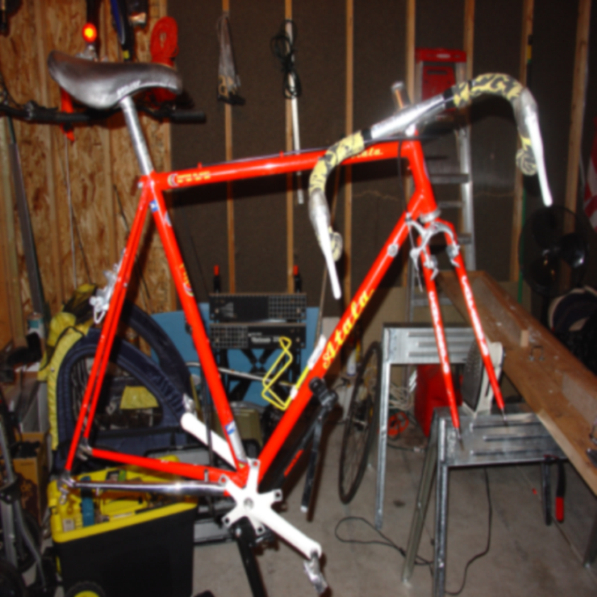 Interested in converting an old Campy road bike to a SS for commuting purposes. Anyone know of a rear SS cog that will work with a Campy hub? Research thus far has lead me nowhere. I am not sure if they are still selling them, but they are what gave me the idea of using a cog as a chaingaurd. A couple of years ago the cycle-dynamics guys responded to an e-mail I sent them fairly quickly. Action Tech may be another group to check out. Good luck to you, and post your results. Thanks Greenfix, some great sites there that I wasn't able to find on my own. I may experiment with the existing cogs but assumed I would need to get something more "SS" specific. The bike does have horizontal dropouts so I'm thinking it will be a pretty easy conversion. Appreciate the advice. Perhaps a little pricey, but it is a one-of-a-kind conversion. How old a bike is it? It might have a freewheel if it is an older bike. My road singlespeed has a Daytona (newer) rear hub, so I just took apart the cassette (they just stack together), chose my cog, and centered it with spacers so the chain line was straight. Campy frame as well, I will post a pic or two in progress. Thanks for all the advice. Commuter. Found a BMX cog that works, still trying to figure out the right ratio. Adding moustache handlebars thusfar with more mods to come I'm sure. Fun stuff, learning a lot. Uh, just FYI Campagnolo never made frames. Campy did however make front and rear dropouts, BB cable guides, and DT shifter bosses. Your bike as it says on the DT is an Alata which is an Italian company with a very long history. The big thing to remember about converting this frame is that the BB is Italian threaded, and thus will make it a bit of a pain to adjust the chainline at the BB. I'd recommend Phil Wood lockrings meshed with a Phil Wood BB or old Shimano UN-7x BB if you need to adjust the chainline up front. The big thing to remember about converting this frame is that the BB is Italian threaded, and thus will make it a bit of a pain to adjust the chainline at the BB. I'd recommend Phil Wood lockrings meshed with a Phil Wood BB or old Shimano UN-7x BB if you need to adjust the chainline up front. How about chainring or BB spacers? My bad, shows how much I know about road bikes. I was wondering why my LBS gave me a weird look last night when I said Campy frame. Thanks for the heads up, I've got someone assisting me with the conversion (I'm here to learn on this one) so I hope it works out OK.
From the pic it looks like a Shimano Sante crank (though it could just be flash reaction with the crank) from the late-80s. If it's painted white then it most likely is, which would mean a standard 130 mm BCD rings and the chainring bolts can be used two chainrings or one chainring and spacers. Or you can grind down the female part of the bolts and use them without spacers. Doh, and sorry roadiegonebad for the misspelling of Atala it was a dyslectic moment. Last edited by themanmonkey; 03-01-2007 at 05:25 PM.